The justice minister says the Sunday Independent “corrupted the content” of correspondence with Enda Kenny. 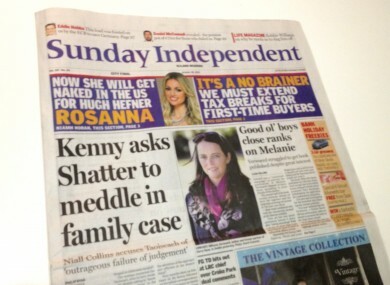 Today's Sunday Independent ran the article as its front page lead story. JUSTICE MINISTER Alan Shatter has attacked a newspaper article published today in which it is claimed that Enda Kenny asked him to ‘meddle’ in a family law case which was going through the courts at the time. The article, featuring in today’s Sunday Independent, discusses correspondence between Kenny and Shatter earlier this year, when Kenny forwarded a letter written by a constituent dealing with the legal case. The article – headlined, ‘Kenny asks Shatter to meddle in family case’ – reports that Shatter ultimately responded by telling the Taoiseach it would be “inappropriate” and “entirely improper” for a member of the government to intervene in such a court case. “This is a gross misrepresentation of the correspondence that took place,” Shatter said in a 979-word statement issued this lunchtime. Shatter said Kenny had never asked him “to meddle” or intervene in the case as had been alleged in the newspaper. “He merely requested ‘that I “examine the points raised” in the constituent’s letter and “advise him in due course”‘ as to the appropriate reply,” Shatter said. I stated in my response to the Taoiseach that “I hope” that his constituent “understands it would be entirely improper for a Member of Government to intervene in any way with Land Registry Records”. Shatter further said the Taoiseach’s constituent was not a party in the case, which Shatter said had been suggested by the newspaper article, and said the use of the word “case” in the letters had been “deliberately misrepresented” to refer to a family law court case when the constituent was not party to any court case. “Having accessed correspondence pursuant to a Freedom of Information request, it is clear the Sunday Independent corrupted the content of that correspondence to fabricate a contrived sensational story to generate a front page headline for the paper’s commercial benefit,” Shatter said. This was deliberately done to damage the Taoiseach’s reputation, to represent me as having admonished the Taoiseach in some way, and to attract critical comment from Oireachtas members who had not read the correspondence concerned. This is a reference to comments from Fianna Fáil’s justice spokesman Niall Collins, who is quoted in the article as describing the letters as “an outrageous failure of judgement”. I am assuming that appropriate steps will be taken by the Sunday Independent and Independent Newspapers to address the fictional presentation presented on the front page of this morning’s paper, to publish an appropriate apology and to correct the record. Email “Shatter says newspaper article is “dishonest and inaccurate””. Feedback on “Shatter says newspaper article is “dishonest and inaccurate””.